I specialize in an innovative, unique method of advanced structural massage classified as Integrated Structural Massage. My goal is to facilitate homeostasis (balance) of the body and counteract dysfunction that can pull the body out of natural alignment. By using my feet with bars for support, I combine compression with vibration to access the deeper layers of tissue to release tension. Releasing this tension helps the body move back into its natural alignment. Chair massage is a popular way of relieving stress and releasing tension right in your home or workplace. You receive your massage in a specialized ergonomic chair which I bring to your location. In addition to the usual health benefits of massage, another benefit of chair massage is that it is done over the clothing. With seated massage, you can avoid the discomfort and awkwardness that you may feel in disrobing for a traditional massage. Also, chair massage sessions are usually shorter than traditional massage, making it convenient enough to fit into your busy schedule. Rates and times vary depending on your needs, call today to get chair massage set up in your home, event, or workplace! 90 minute sessions also available! Buy a package and save! $240, 4- 60 min sessions. $360, 4- 90 minute sessions. As always, each session is customized to meet your needs! 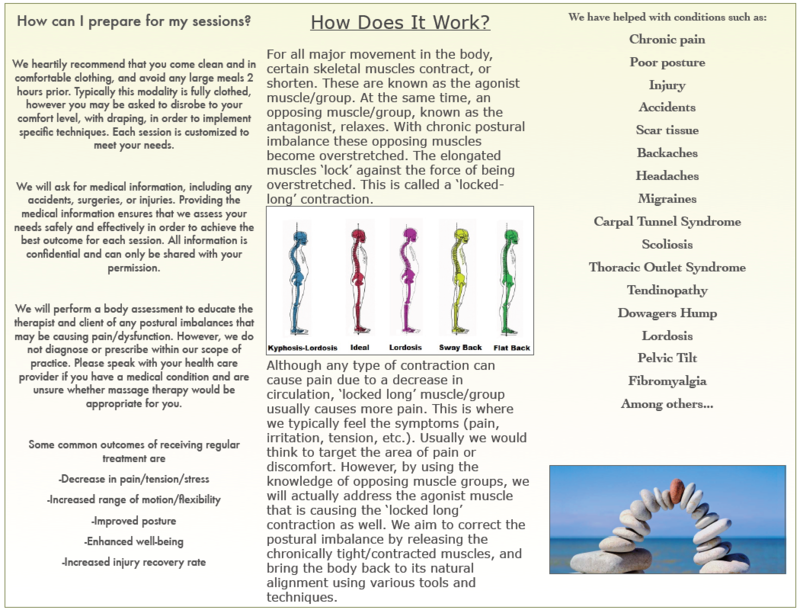 This signature massage incorporates various techniques to achieve goals such as increased relaxation, decreased muscle tension, and increased movement ability. With a short discussion we will determine the specific goals for the session before we begin. A combination of Swedish, Structural Integration, Trigger Point Therapy, Sports Massage, Cranial Sacral Therapy, and other techniques will be chosen to match your desired outcome for the session. Various techniques specifically applied to relieve symptoms caused by muscle and soft tissue injuries/compensations due to injury. Goals of this type of treatment are to increase range of motion/flexibility, decrease pain, decrease recovery time of muscles and soft tissues.